The examen is the central spiritual practice of Ignatian Spirituality – it’s kind of as it sounds, a way of examining your life, your conscience and understanding what God might be doing in your life. This is a 6 part series that you could undertake at any time of day but is designed to be done over a lunch break. Struggling to feel God’s presence at work? Why not try it out? 6 days isn’t a huge commitment! 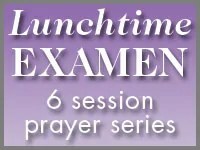 Knowing that not everyone prays at the same pace, you have control over the pace of the Lunchtime Examen. On each screen, a Continue button will appear. Click it when you are ready to move on. Please be patient if it takes a few moments to load the Flash presentations. Session 1: Why is this a good way to pray? Session 2: Where can I find God? Session 3: What do I pray about? Session 4: What do our feelings have to do with prayer? Session 5: What does the Examen have to do with being honest with God? Session 6: What shall I do?